A migrant to Austria would prefer convenient procedures to access his or her work permit to work in Austria. The Austrian Red and White Card make migration to Austria easy and smooth. The primary aim is to make the permanent settlement of the third country workforce along with their families in Austria less tedious. Under the Austrian Red and White Card visa scheme the migrant has to follow a point system to settle permanently in Austria. What is Austrian Red and White Card? 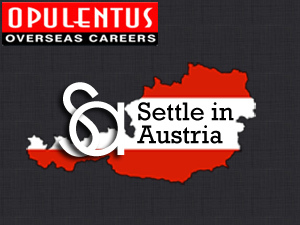 The work visa candidates who are successful in securing visa to Austria will be provided with a 6- month residency permit to either seek a job or work. The Red and White Card will be provided for a period of 12 months after a job seeker finds a job based upon his or her qualification. It will provide one with the facility of taking one’s spouse and children below 18 along with them to settle in Austria for work. One’s spouse can also get the Red and White Card and can start work immediately. After a 5- year residency status, one can get Permanent Residency as well as Citizenship. Austria, with a population of 8.4 million people is located in Central Europe. Although, Austria did face the difficulties of recession, there are varied job opportunities in sectors such as manufacturing, health-care, social work as well construction and so forth. It has a high standard of living and holds the 25th rank in the Human Development Index. Austria is a popular European city and has also carved a niche in the European economy market. Highly qualified job seeker can apply for the card hoping to reside in Austria and search for a job. High level managerial skills are required and one must be committed to work to settle in Austria. Must be skilled in areas that local talent is not available. Must possess relevant degree and qualification. As compared to other academic disciplines, social sciences and arts skills are not much in demand. Knowledge of German is essential and also it is an asset to know an East European language. The Red and White Card is a bit akin to US Green Card reflecting the colors of Austrian flag, making Austria immigration easy and convenient.